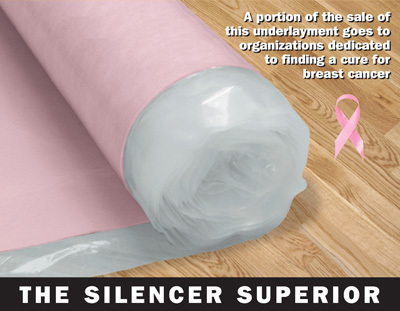 Silencer Superior™ Pink is suitable for all Floating laminates, engineered and hardwood flooring installations. Offers the best support, moisture protection and sound absorption for your floors. In geographic areas where concrete subfloors are subject to excessive moisture, a calcium chloride moisture test is required. Vapor emission readings in excess of 4 lbs. per 1,000 square feet in 24 hrs will require additional protection such as concrete sealant or polyethylene sheeting. Roll out underlayment with tape strip next to wall. Roll out next row in same manner butting underlayment close to first row ( do not overlap ) and covering the moisture barrier film. Remove the tape strip and secure the overlapping moisture barrier film. ultra•fresh™ is a registered trademark of Thomson Research Associates Inc.